I volunteered to bring an appetizer for a dinner with friends last weekend. They recently returned from a three-week trip to Turkey so I opted for something that might remind them of their travels. This recipe is Turkish, but is reminiscent of dishes found in several countries along the Mediterranean Sea. I both love and hate phyllo. It’s so incredibly thin and delicate that it can be a little challenging to work with. However, since most recipes call for layering several sheets and buttering each layer, you soon learn that you can repair any tears or broken pieces. And the results are always delicious! 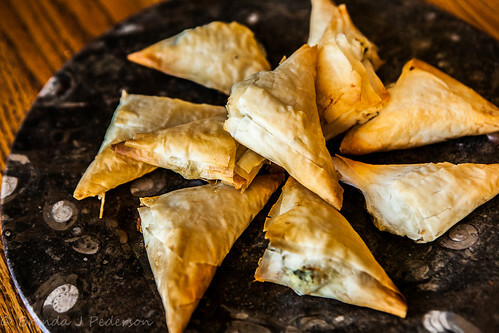 Another advantage is many recipes that use phyllo call for baking, not frying, yet you get that crispy outer layer. That’s also an advantage when preparing them for company and it gives them staying power. I had several of these leftover and even after storing in the refrigerator for a few days they are still pretty crispy. It’s also easy to pop them in the oven for five or ten minutes to warm and re-crisp them. For the filling, combine cheeses, egg, nutmeg, chives, dill, mint, parsley, pine nuts, salt, and pepper in a large bowl. Mash with a fork. Set aside. For pastry, stack the phyllo sheets and with scissors, cut into 3 x 14-inch strips. Stack strips and cover with a slightly dampened towel. Preheat oven to 375° F.
Place one strip of phyllo on work surface. Brush lightly with butter. Place another strip on top and brush lightly with the butter. (Keep remaining strips covered.) Place heaping teaspoon of filling at one end, about 1 inch from the edge. Fold one corner over the filling to meet the opposite corner, forming a triangle. Lift triangle and continue to fold as you would a flag, until the whole strip is folded into a small, triangular parcel. Make sure there are no holes in the dough. Brush top of triangle with butter; place on a buttered baking sheet. 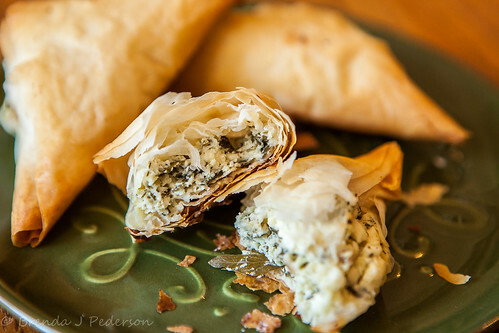 Repeat with remaining filling and phyllo. Bake 15 to 20 minutes, until golden brown and crisp. Serve hot, warm, or at room temperature. Tip: The unbaked Borek can be prepared early in the day, placed on baking sheets, covered with plastic and refrigerated until you are ready to bake them. They may also be made up to 2 weeks in advance and stored in the freezer until you are ready to use them. Defrost before baking. 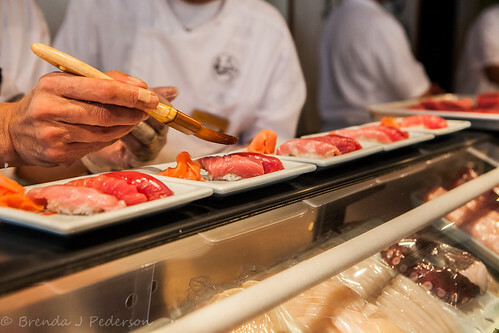 It’s hard to believe that Shiro’s Sushi has graced its quiet corner in Belltown for twenty years! The small space is not fancy; it’s a little crowded. There’s often a long line to get in; although they will take reservations. But once passed the hurdles of getting seated, the food and the care and the hospitality more than make up for any trouble. Shiro Kashiba has a long history of educating Seattle on the beauty of raw fish. A few years ago he wrote a memoir detailing his experience. (For a nice summary of his experience see Nancy Leson’s article about the book.) He’s responsible for training many of our local sushi chefs. He’s been a James Beard nominee. Several years ago he sold his restaurant to Yoshi Yokoyama, who also owns I love Sushi in Bellevue, but continued to work a few days a week. Now, Shiro has decided to complete his retirement. Although he hinted there may be a new project in store. 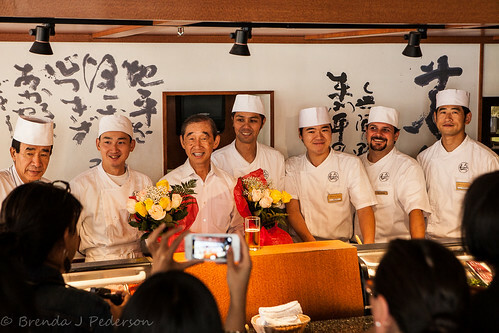 Wednesday, Shiro’s Sushi hosted a small event to celebrate their twentieth anniversary, Shiro-san’s retirement, and to introduce the chefs who will now carry on his traditions. The group of six has an impressive history, training and background. Jun Takai will lead the team. He’s been at Shiro’s since 2012. 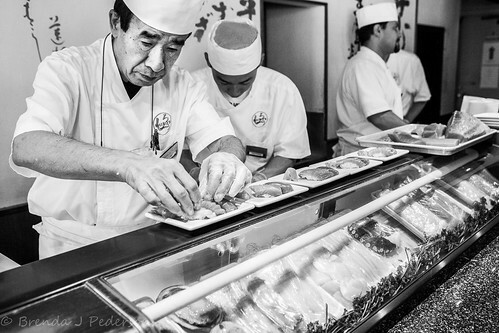 All the chefs have many years of experience with one, Toshio Matsudo, claiming 47 years as a sushi chef! 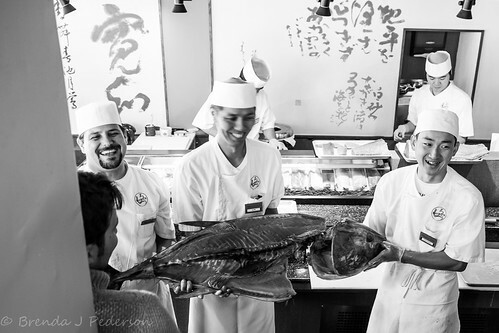 After the speeches we celebrated with fresh bluefin tuna, that we watched the chefs prepare from the whole fish. Shiro’s is in good hands. I was sad to hear today of John Sarich’s passing. I’ve mentioned him a few times here on the blog but he actually played a much larger role in my Seattle food and wine experiences. I first experienced his work at his restaurant Adriatica, which was an amazing dining experience from the location to the food. I took classes from him a few times, or attended events at Ste Michelle, as well as other places, where he was cooking or advising. Besides being incredibly talented, I always thought he was a very nice person. Genuine, kind, thoughtful. He was happy to talk to anyone and everyone and at many events that was a pretty large group. He will be missed here in the Seattle area, and around the world, both within and outside of the culinary community. I’m not entirely sure what made me decide to make this recipe because I’ve never ordered a pumpkin spice latte, or PSL as they are commonly known, at Starbucks or any coffee shop. Maybe it’s because the name made me think there’d be pumpkin flavoring in the coffee (yuck!) but when I saw the recipe I realized it’s pumpkin spice, not pumpkin and spice. Did that make sense? So I decided to give it a try. I did a couple of things slightly differently then the recipe specifies. First, I infused the milk the day before and stored it in the fridge. I generally make my coffee as a little break in my work day so wanted to be able to pull this together fairly quickly. I only frothed half the milk and didn’t even use it all. I like my coffee drinks to emphasize the coffee more than the milk. But that’s just personal preference. I know Starbucks adds whip cream to the drink. This recipe doesn’t call for it and I normally skip the whip cream, but that might be something you’d like to add. 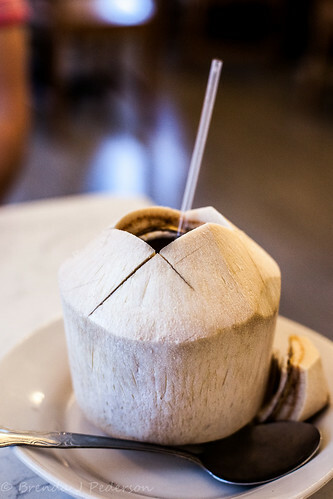 Since I’ve never ordered a “professional” version of this drink I have no idea how close it comes to what you’d get in a coffee shop, however, I thought it was really good! Now I get why people look forward to them. Perfect for a slightly chilly morning. In a small saucepan over medium heat, combine the milk, sugar, cinnamon stick, allspice berries, whole cloves and 1/8 teaspoon of the nutmeg. Bring to a simmer then turn off the heat, cover and let stand 10 minutes. With a slotted spoon, remove the whole spices and discard. 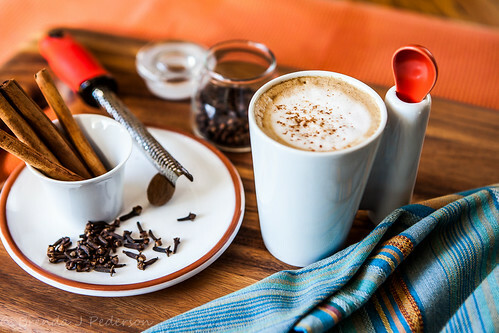 Heat the spice-infused milk over medium-low heat until hot, then use a milk frother to foam the milk (alternatively, you can transfer the milk to a blender and blend until foamy). Pour the hot espresso into a mug and top with the hot milk, pouring the milk over the back of a spoon into the mug to hold back the foam. Then spoon the foam on top and garnish with the remaining nutmeg and the ground cinnamon. I’m definitely a carnivore, although I regularly make and eat many, non-meat meals. I still hesitate, however, going to vegetarian restaurants. Mostly because I’ve had a few bad experiences. And I like the option of meat. 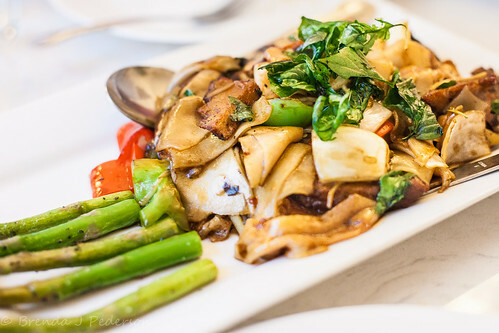 So I had a little trepidation when friends suggested dinner at a new, vegetarian*, Thai restaurant, Araya’s Place, in Madison Valley. But I had nothing to worry about. Housed where Rover’s, Thierry Rateaureau’s French, (very!) fine-dining location, was until it closed earlier this year, this is the second Araya’s Place in Seattle. There’s a third location in Los Angeles. Walking into the restaurant was like having one of those dreams where everything seems familiar yet you know you’ve never been to the place before. You can still see the bones, the structure of Rover’s, but the space has been completely opened up; there’s not a tablecloth in sight; plush curtains and wall hangings are gone; and what was cozy and refined is now bright and relaxed. It’s a pleasant space and I appreciated the bare windows letting the last of the day’s light into the space. We shared a selection of items and it was all delicious. My worries were totally unfounded. 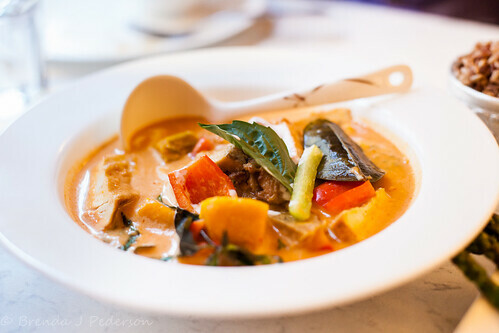 Lots of lemongrass, Kafir lime leaves, Thai basil and other Thai flavors perfumed our meal; each dish was an exotic delight. Portions were generous – I was the lucky recipient of all our leftovers – three of us could not finish two appetizers, a soup, and two entrees. It’s nice to see Rover’s revived as another great Madison Valley dining option. 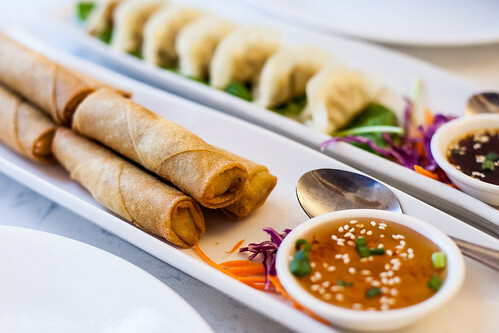 *Araya’s also has a number of vegan dishes. The sun is rising later and setting earlier. Warm days give way to cool, sometimes even chilly, evenings. My big Japanese maple tree is turning color. Already. Technically, autumn begins on September 23rd this year but my brain and body are already making the change. The last post, Spicy Corn Soup, was a summer soup. 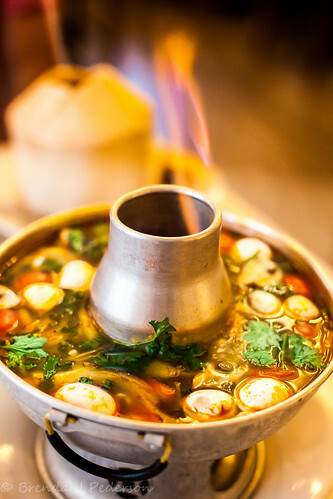 Today I’m thinking of soups that warm you from the inside out. Heartier soups. The photo below is a chicken pasta soup I made a week or so ago when we had gray day. It’s one of those “look-in-the-fridge” soups. As long as I have an onion, a couple of carrots and some sort of stock or broth I can pull a soup together by adding odds and ends from the pantry and fridge. But this post isn’t really about a recipe. (If you are looking for a recipe there are several here on the blog.) Lately I’ve been thinking about a Soup Swap I hosted a few years ago. It was a lot of fun and I meant to host another the next year. Well, somehow……. it’s now been over three years since that first swap! Funny how that happens. So I’m determined to do another this year. I’m going to change a few things based on what I learned the first time around but the basics will remain the same. 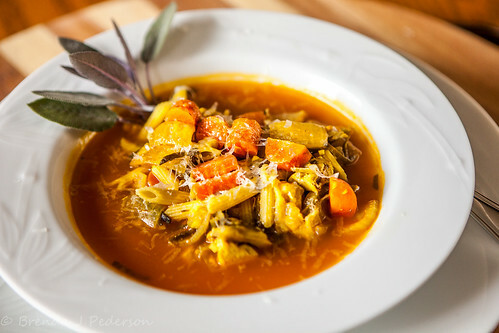 I encourage you to think about hosting your own soup swap – that’s really what I wanted to say! 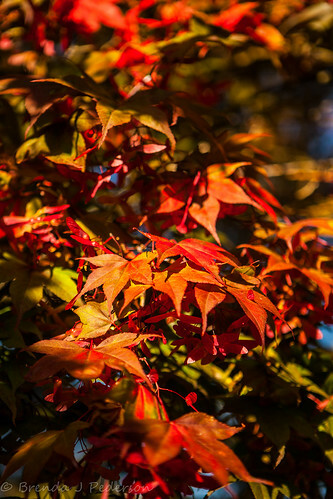 The holidays will be here before you know it, so you may want to plan something for late October or early November. Or, maybe better, start thinking about a January event. After the holidays are over it’s a little bit quiet. Perfect timing for connecting with friends in a more relaxed way. As we move from summer to fall, gardens and farmers’ markets are filled with so many options. There’s still some stone fruit available, but we’re also seeing apples and pears. Tomatoes are in full swing. Cucumbers are starting to wane, but eggplants are bountiful; and squash and pumpkin are coming into their own. One of my very favorites, sweet corn, is everywhere. A place I always visit when in Prosser, Washington is Wine O’Clock. I’ve had the pleasure of dining there a few times and highly recommend it. A couple of years ago a friend and I had lunch there and had the most delicious, fresh-off-the-cob, corny, corn soup! I still think about it. I searched my cookbooks and online for a recipe that resembled the soup of my memory, to no avail. But I did find this interesting recipe from one of Bobby Flay’s shows on Food Network. I recently made this for a dinner with friends where I was assigned the appetizer. 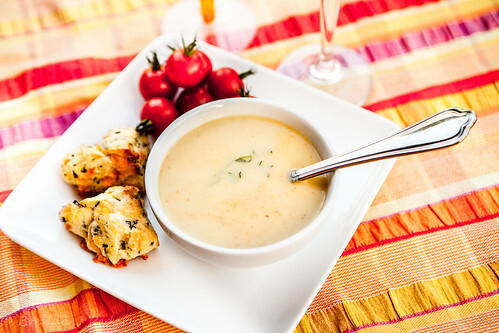 I served small bowls of soup along with a couple of tiny, savory scones. The scones are based on Ina Garten’s Cheddar-Dill Scone recipe. It is one of my go-to recipes; it never fails and people love it! I made one-half recipe; substituted a mix of chives and thyme for the dill; then used small 1½” – 1¾” round, square and triangle cutters to make tiny 2-bite scones. I made a few changes to the soup recipe, too. I think the amount of chipotle in the original recipe was incorrect, although Bobby is known for heat in his food. My advice is to start with the 1 tsp I used and if you think the recipe needs more after you’ve added the cream then add a little more but I would not start with the 1 tablespoon in his recipe. The generous teaspoon added a nice little burn without being too hot. To allow the soup to really highlight the corn, I halved the amount of cream. Finally, I made the pepper sauce as they suggested but it was more pink than red. There wasn’t enough contrast with the color of the soup. So I’ve changed the recipe below to what I would try next time, hoping that by reducing the cream-to-pepper ratio I’d get a nice bright red color. In the photo above I’ve added some of the pepper sauce but stirred it into the soup. I really liked this soup! Serve it warmed, but not piping hot. This post is an idea, more than a recipe. 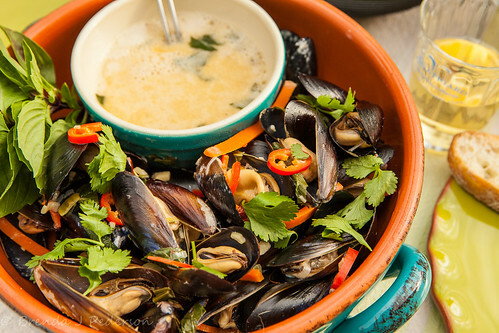 You might remember the photo from the Thai Mussels post I wrote a few weeks ago. In that post I mentioned how delicious the broth is. And it is! When all was said and done I had quite a bit leftover. It suddenly occurred to me that I could use it another way. The next day I made risotto using the leftover broth. I adjusted the risotto recipe for the amount of broth that was left. It was so good! Last weekend, friends and I had a big seafood feast on Saturday night. My contribution was a riff on a traditional steamed clams dish. There was both broth and a few clams remaining at the end of the evening. I pulled the clams from their shells, strained the broth and brought them all home. A couple of days later I made risotto with the broth and just before serving added the clams, too. Again, delicious! I have no idea why I haven’t done this before but you can bet I’ll be doing a lot of it in the future. If risotto is not your thing, you can always use the broth for regular rice, or as the base of a soup, as the start of a pasta sauce….. the possibilities are endless. I’m thinking it might even add interesting flavor to a poached egg – that will be my next test. Don’t let the term “galette” scare you because it sounds a little fancy! A galette is simply a rustic, one-crust, pie or tart. In many ways they’re easier to make than pie. since there’s only one crust, I don’t feel as guilty enjoying a piece! I roll out my dough a little thicker than I do for pie, probably just under ¼”. As a rule of thumb, a crust rolled out to a 11″ – 12″ round will hold about 4 cups of prepared fruit. Once it’s rolled out, carefully move the crust to a baking sheet that’s been covered with parchment paper or a Silpat sheet. If it tears when you move it, patch the tear with a piece of dough from the edge and a little water. Slightly mound the filling in the center of the crust leaving about a 2″ border. Starting on one side and continuing around, fold the border up over the filling, overlapping and pinching the dough to create a rustic edge. While you are not too concerned about “pretty”, you want to make sure the edge will hold together to help keep liquid from spilling out as it bakes. Having said that, there’s a good chance some will spill, but don’t worry about it, if it does. Once folded and pinched, you can brush the dough with an egg wash, if you’d like. I generally do not. For the filling you can use any sort of pie filling recipe that calls for four cups of fruit. (I know that rhubarb is a vegetable but we tend to treat it as a fruit!) 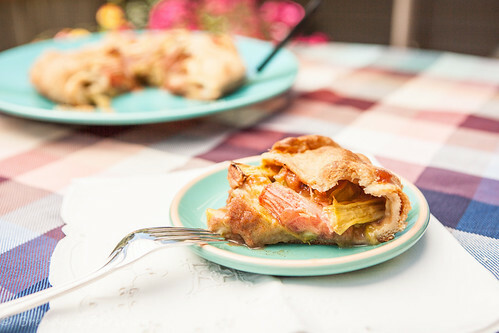 Or you can add a bottom filling under the fruit, similar to the one in this Plum Galette recipe by Jacques Pépin. I made it over the weekend and it was great! Two weeks from tonight one of Seattle’s best events will take place on the cobblestones of Pike Place. 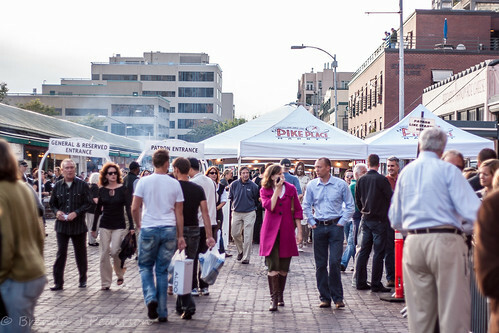 Sunset Supper at Pike Place Market will be celebrating its 19th year! Seattle’s top chefs, restaurants, wineries (well, Washington wineries), breweries, distilleries and no-alcohol beverage makers will donate time and materials to support this benefit for the Pike Place Market Foundation. The Foundation provides services in four major areas: a senior center, including housing; a pre-school; a food bank; and a medical clinic, all within the heart of the market. Besides your dollars supporting these great programs, you get to sample bites and sips from a great lineup of contributors. It’s a win all-around. You can see the full list of vendors here. I’ve attended the last few years and will be there again this year. It’s a fun event and a perfect time of year to enjoy a warm Seattle night outside. The event often sells out – especially the Patron tickets – so don’t wait too long. Get your tickets now!